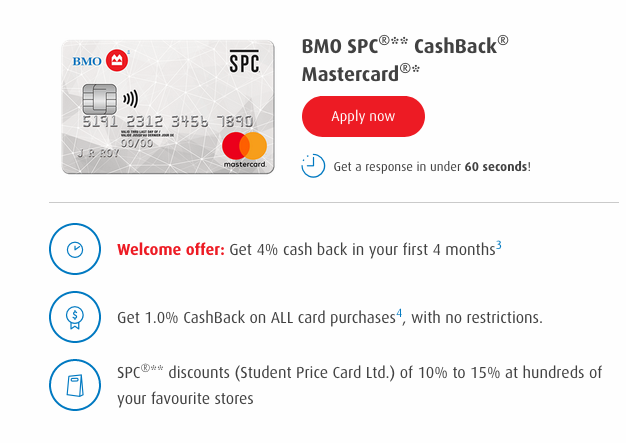 Alright students there is a new lucrative offer out for the BMO SPC CashBack Mastercard! If you don't have this card right now would be a time to consider it since it will award 4% cash back on all eligible purchases in the first four months of having the card. This is one of the highest returns we have ever seen on a no annual fee cash back card! The bonus ends after four months or $3,125 in spending, whichever comes first. The bonus before this offer was a $60 cash back sign up offer while this new bonus allows you earn up to $125 cash back so it can richer than the old offer as long as you can funnel enough spending on the card.